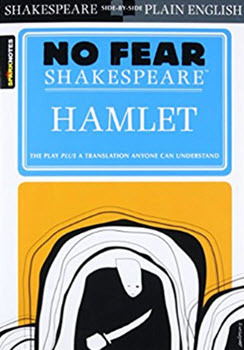 No Fear Shakespeare is a line of books that offers modern English translations of Shakespeare's famous plays and sonnets. The modernized versions make reading the plays much easier. This modernization obviously reduces the dramatic impact and experience that comes from reading Shakespeare's plays (especially if being read aloud). 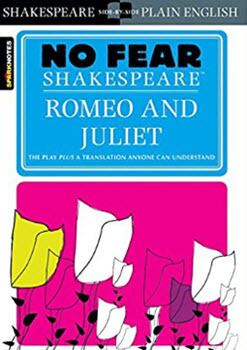 However, since No Fear Shakespeare puts the original text and translated text side-by-side the books make a great tool for young readers and first-time readers of Shakespeare plays. The No Fear Shakespeare books can be found online at Sparknotes. They can also be found in bookstores. Here are a few of the books with examples showing how the translations work. Romeo and Juliet (No Fear Shakespeare), also available at Amazon.com. "But to be frank, and give it thee again. And yet I wish but for the thing I have. The more I have, for both are infinite." This is translated by No Fear Shakespeare as "Only to be generous and give it to you once more. But I'm wishing for something I already have. My generosity to you is as limitless as the sea, and my love is as deep. The more love I give you, the more I have. Both loves are infinite." 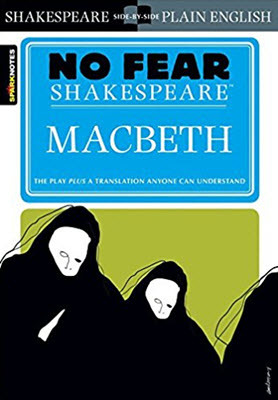 Macbeth (No Fear Shakespeare), also available at Amazon.com. Lizard's leg and owlet's wing." This section is translated as "We’ll boil you in the cauldron next-a slice of swamp snake. All the rest of you in too: a newt's eye, a frog's tongue, fur from a bat, a dog's tongue, the forked tongue of an adder, the stinger of a burrowing worm, a lizard's leg, an owl's wing." Hamlet (No Fear Shakespeare), also available at Amazon.com. This is translated by No Fear as, "Don't borrow money and don't lend it, since when you lend to a friend, you often lose the friendship as well as the money, and borrowing turns a person into a spendthrift. And, above all, be true to yourself. Then you won't be false to anybody else." You can find more Shakespeare resources on our dedicated Shakespeare Resources page.